Nikolić, D. (2015). Practopoiesis: Or how life fosters a mind. Journal of theoretical biology, 373, 40-61. The mind is a biological phenomenon. Thus, biological principles of organization should also be the principles underlying mental operations. Practopoiesis states that the key for achieving intelligence through adaptation is an arrangement in which mechanisms laying at a lower level of organization, by their operations and interaction with the environment, enable creation of mechanisms laying at a higher level of organization. When such an organizational advance of a system occurs, it is called a traverse. A case of traverse is when plasticity mechanisms (at a lower level of organization), by their operations, create a neural network anatomy (at a higher level of organization). Another case is the actual production of behavior by that network, whereby the mechanisms of neuronal activity operate to create motor actions. Practopoietic theory explains why the adaptability of a system increases with each increase in the number of traverses. With a larger number of traverses, a system can be relatively small and yet, produce a higher degree of adaptive/intelligent behavior than a system with a lower number of traverses. The present analyses indicate that the two well-known traverses – neural plasticity and neural activity – are not sufficient to explain human mental capabilities. 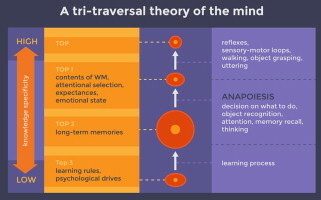 At least one additional traverse is needed, which is named anapoiesis for its contribution in reconstructing knowledge e.g., from long-term memory into working memory. The conclusions bear implications for brain theory, the mind–body explanatory gap, and developments of artificial intelligence technologies. Nikolić, D. (2016). 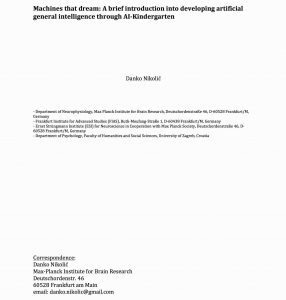 A brief introduction into developing artificial general intelligence through AI-Kindergarten. White paper. Development of artificial general intelligence (AGI) may not be possible exclusively through human-created algorithms. Many aspects of human brain are not understandable to human scientists and engineers. 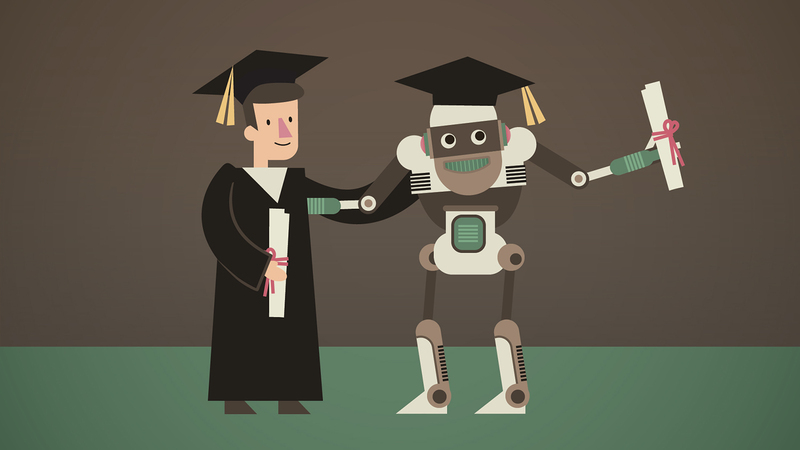 Instead, AGI may require machines to create their own algorithms i.e., machines that learn to learn. It has been proposed that this can be achieved through AI-Kindergarten. In AI-Kindergarten machines are not left alone to figure out on their own the necessary algorithms, but they are heavily guided through human feedback. The feedback comes in a form of everyday interactions but also in a form of scientific knowledge about development of species and individuals. Information obtained from humans is integrated through a computational process that corresponds to the biological function of sleep and dreams. Importantly, AGI created that way has no danger of going rogue. It is completely safe while maximally benefiting humanity. Nikolić, D. (2017). 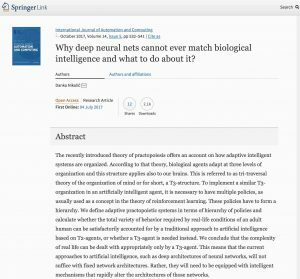 Why deep neural nets cannot ever match biological intelligence and what to do about it?. International Journal of Automation and Computing, 14(5), 532-541. The recently introduced theory of practopoiesis offers an account on how adaptive intelligent systems are organized. According to that theory, biological agents adapt at three levels of organization and this structure applies also to our brains. This is referred to as tri-traversal theory of the organization of mind or for short, a T3-structure. To implement a similar T3-organization in an artificially intelligent agent, it is necessary to have multiple policies, as usually used as a concept in the theory of reinforcement learning. These policies have to form a hierarchy. We define adaptive practopoietic systems in terms of hierarchy of policies and calculate whether the total variety of behavior required by real-life conditions of an adult human can be satisfactorily accounted for by a traditional approach to artificial intelligence based on T2-agents, or whether a T3-agent is needed instead. We conclude that the complexity of real life can be dealt with appropriately only by a T3-agent. This means that the current approaches to artificial intelligence, such as deep architectures of neural networks, will not suffice with fixed network architectures. Rather, they will need to be equipped with intelligent mechanisms that rapidly alter the architectures of those networks.